The Philippine eLearning Society,the premiere organization that spearheads the advancement of eLearning in the Philippines, cordially invites its members and elearning practitioners to its first ICETalks Series on November 21, 2017 in collaboration with the University of Santo Tomas. ICETalks bring together elearning experts, thought leaders and practitioners in the academe, industry and service partners to help propel your elearning implementation in your institution or self-initiated online activities. 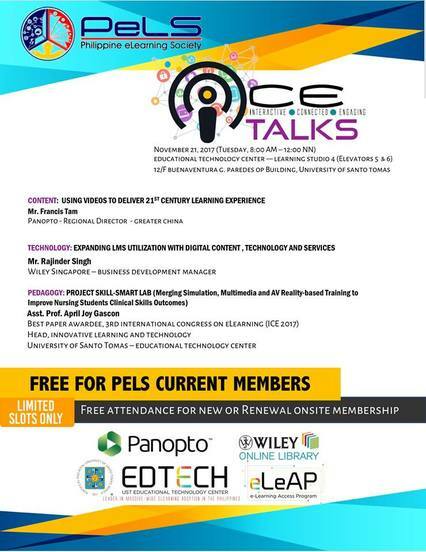 We cordially invite you to our very first PELS ICETALKS 2017 in collaboration with Panopto, Wiley and University of Santo Tomas. Slots are limited and so we encourage you to get your free tickets. Print or show copy of eticket at the registration area. See you on November 21!